Johannesburg - It’s a work in progress for Mayfair-based outfit Orlando Pirates, after they were beaten 3-1 at a home game yesterday against Mamelodi Sundowns. 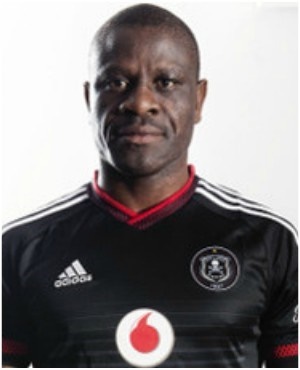 Former Orlando Pirates captain Lucky Lekgwathi said the team is playing very well compared to last season and the supporters are happy with Ezimnyama’s recent performances. “I think the supporters are very happy with the current performance of the team, they play very well although we’ve been losing against Sundowns, but I think this season we going to win something,” the Ga-Rankuwa-born former player said. “No guys don't give up Bucs is playing a beautiful ball, remember we are building a new team soon you'll be surprised," said a fan on Twitter. Pirates’ Wayne Sandilands conceded two soft goals and that worked as an advantage for the African champions as they didn’t look back and ensured they sealed a win away from home after back-to-back defeats. Lekgathi told DRUM it’s a work in progress for the Premier Soccer League giants, so a player can’t be judged on one game and he also feels Sandilands should be given a chance. “Silly Mistakes.....Top-notch performance," said another fan on Twitter. “You can’t judge a player with just one game, the team has been playing well and Wayne (Sandilands) needs to be given a chance. It was one of those days were he conceded two soft goals but he isn’t a bad player but for me I still rate him high," said Lekgathi. “Yesterday the team lost with dignity. They had a fighting spirit unlike last season. Everyone wants to play for the team now. We were not defeated yesterday because we’re a bad team. We are still trying to find right combinations,” Lekgwathi said. Lekgwathi also stated that Thabo Qalinge is a very consistent player: "He’s got his confidence back under Pirates head coach Milutin Sredojevic and he needs to be selected for the national team. “So far Thabo is having a very good season and what I like about him is that he’s a very consistent player. It was not his day yesterday but with the run of the balls, you could tell that the boy is on fire. “He missed several chances yesterday but it proves that he’s been working on his positioning and he’ll improve because time is still on his side. I think we need his quality in the national team at this moment,” Lekgwathi concluded.